The famous films like Oscar winner Slumdog Millionaire were acquired by CineForm RAW compression for most images, and also the 127 hours. The KineRAW-S35 can record the Cineform ™ as compressed raw using very high quality wavelet compression: visually lossless, and making work-flow more efficient. And KineStation can transcode CinemaDNG footages from KineRAW-MINI into Cineform RAW. So KineRAW is linked with Cineform closely. Cineform Post-production is always “online” meaning you edit your CineForm master files with your favourite post-production software tools – no proxy files, no conforming, and no specialised hardware. Workflow base on Cineform can not be simpler: Shoot, Edit and Grade directly on footages, realtime, no need proxy. Avid Media Composer, and more. In short, for application compatibility, most AVI/MOV compatible editing and effects applications can work with Cineform codec, with the help of GoPro CineForm Studio. Recommend: GoPro Cineform Studio Premium(Trial)+ Quicktime7 on MAC OS, while GoPro Cineform Studio (free) + Quicktime7 on Windows. Most RAW format cameras are single- sensor and use Bayer color filter arrays to create color Bayer data cannot be viewed natively – must be processed into color information. There is a key process as debayer/demosaicing to produces color images and details. Cineform RAW is encapsulated as Quicktime mov which low-level codec API acts as a universal buffer between the RAW Bayer files and the host applications such as NLE softwares and grading softwares. Users can interact with files wrapped in RAW Bayer codec like any other codec-wrapped movie file. There is an option in the Cineform decoder (in Cineform Studio/Cineform Studio Premium) for users to choose which debayer/demosaic. Generally speaking, default debayer is a simple, fast demosaic filter suitable for real-time playback but not suitable for final rendered output. During editorial it is best to use BiLinear Demosaic because it requires the least CPU resource. Think of the progression of Demosaic algorithms between default and CF Advanced Detail 3 as providing additional sharpening detail in your final output. Default: When set in Default mode the BiLinear Demosaic is always used for timeline playback during editorial. During high-precision render the CF Advanced Detail 1 demosaic is used. Suggestion: For your own experimentation, evaluate different demosaic modes during render to see what level of sharpening is best suited to your needs. For windows, right click the Cineform icon in the windows system status bar; pop up Cineform menu →Decoder Settings→Demosic Type→Advanced Details 1/2/3. For MAC, you have to set the debayer option in Cineform Studio Premium/Firstlight. Active Metadata: non-destructive, real-time primary color correction application for GoPro-CineForm media plus text, graphics, and tools overlays. Cineform Studio/Cineform Studio Premium works in parallel with your editing and effects software, and maintains color adjustments and image framing as Active Metadata with your media – all processed in real time so you never need to render, and consequently you never clip highlights. Cineform Studio/Cineform Studio Premium color adjustments are immediately visible in any application that calls a GoPro-CineForm file. KineRAW ™ cameras automatically convert the in camera monitoring LUT into a 3D-LUT in each shot folder for color matching in various post production tools so that the ‘look’ you experienced when shooting and looking at the camera’s monitor can be well duplicated in the processed footage you convert from the camera’s raw data to your end use format. The color matching using the 3D-LUT works best with the Cineform ™ codec maybe and that makes the Cineform ™ workflow a good choice for fast throughput for applications like ENG and Sports type film-making where there is no time for grading the footage, in that case Kine709 would be the preferred in camera LUT and the 3D-LUT made from the Kine709 would automatically ‘grade’ the footage with a ‘one light’ processing to end use contrast and saturation. KineRAW-S35™ records following contents if choosing Cineform codec. 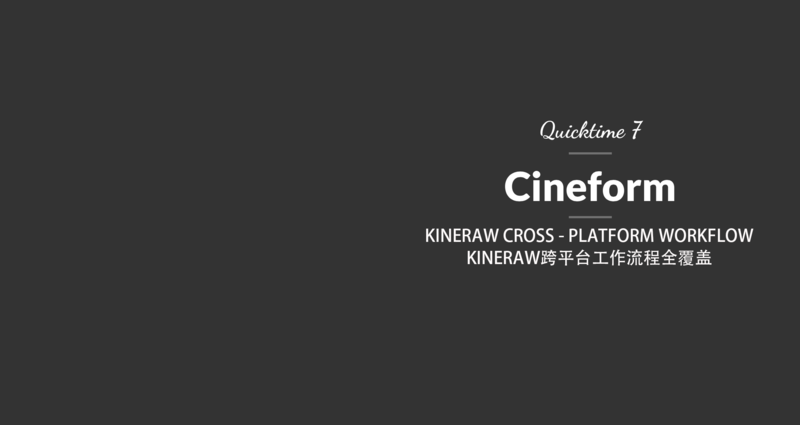 Cineform RAW encapsulated as quicktime mov embedded with audio and timecode; there is a mark in the meta data of the Cineform RAW to LUT when recording. Using KineStation can turn the RAW sequence into Cineform RAW mov, so that workflow can be Cineform quick workflow. The great feature of Cineform RAW when playback the cineform RAW clip, it will load the LUT when recording. That means you can easily get What you playback is the same with What you saw on the monitor when recording. If you did right white balance and got right exposure, you did not need to grade the clips for quick workflow. And you could also set the playback option without the LUT, then the clips comes back to clips with latitude much better than Clips with LUT. In short, you do record RAW clips with max grading room, and but also the video you can use right now. As said before, In short, you do record RAW clips with max grading room, and but also the video you can use right now. Here we suggest six workflow for you, based on your platforms and the needs on the final outputs. Rendering out to get final output. Notes: Davinci Resolve 9.0 does not support the active metada of Cineform RAW, while most other DI softwares do support the active metadata of Cineform RAW, like Speedgrade, AfterEffects, etc. Using AE or Speedgrade of CS6 or CC to grade these edited clips, no need to generate an XML netlist as swap list. Notes: Adobe grading softwares support Active metadata of Cineform, and so support the debayer options too. And there is powerful de-noise plug-in as AE Darkenergy in Windows, so that you could get sharper (by Debayer option) and cleaner (by DarkEnergy) images easily. Export ProRes444 and ProRes422HQ after editing job is done. Import the ProRes video into DI software, and grade it. Actually, it is same with other ProRes workflow after it is converted into ProRes file. You need to choose debayer option advanced details when exporting to ProRes to get sharp images. Grade the RGB444 video in DI software. This workflow is intended to TVC with high requirements on image quality, but with low budget for front-end shooting. RGB444 is very close to RAW. Platform: Windows + MAC. It demands Windows if using DE Plug-in, else both platform can work with CF RGB 444. Notes: you need to purchase Cineform Studio Premium to output RGB444. Grade the CF YUV422 video in DI software. Notes: you don’t need to buy Cineform Studio Premium, and the free Cineform Studio is enough. Import the adjusted clips into NLE software to edit. If you did right white balance and got right exposure, you may just do first-level grading in Cineform Studio or Firstlight. Why need to install Cineform Decoder? What's the Cineform Studio and Premium? Cineform Studio Premium: Powerful first grading software Firstlight and uniform transcoding software as ReMaster/HDLink, also editing software as Cineform Studio. US$299. Recommended for MAC platform. For MAC platform, most functions of firstlight can work well after trial is expired, but you can not output Cineform RGB444. How to playback Cineform RAW mov to restore the color when recording, in Windows? KineRAW-S35™(or KineRAW-MINI+KineStation) records following contents if choosing Cineform codec. Choose Lookinstaller App to install the look or cube file as the following image. Then playback the Cineform mov again, it will take effects on Quicktime 7 and any NLE software when editing. How to load the LUT when recording or not, in Windows? 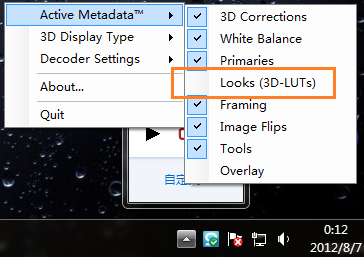 You have option to load the LUT or not, when playback. It will take effects on Quicktime7 and any NLE software when editing. Right click the Cineform LOGO, pop up menu, Active Metadata–>Looks(3D-LUTs): Marked to playback with LUT, Unmarked to playback without LUT (Logged image). Besides, suggest to set the filter 422 to 444. How to install LUT matching the Cineform mov clip, in MAC? Note: Cineform links the monitoring LUT when recording. When it playbacks on the workstation, it loads the LUT automatically if the LUT is registered before. How to playback Cineform RAW mov to restore the color when recording, on MAC? Cineform RAW mov will not load LUT when playback if not registering LUT. It shows LOGGED image and not sharp. You need to register/install the LUT when recording, then click the Cineform LOGO to choose LOOK option on the status bar, on MAC. Import the clips into Firstlight, and set debayer option to Advanced Details 1/2/3 in Firstlight. How to activate to Cineform Studio Premium? Please visit the official website of Cineform Studio Premium for more about purchase and activation of the great software. Though these tutorials were made in Windows, they works in MAC platform. This tutorial explains how to playback Cineform RAW clips, need what kind of codecs, and what is LUT recorded by KineRAW. This entry was posted in Downloads, Workflow and tagged Cineform, Cineform, KineRAW-MINI, KineRAW-S35, KineRAW-S35.